For many people around the world, instances of what is described as organized crime may be part of their everyday experience; in their neighbourhoods, their streets, and the places they work and live. Policymakers, law enforcement, and the media rarely fail to bring up the issue when discussing the nature and seriousness of contemporary criminal threats, and the appropriate responses towards them. Many more people are familiar with the notion of organized crime, as the film and TV industry regularly draw on fictional and real figures and situations. Organized crime feels like a tangible, inescapable issue in today's world. In this Very Short introduction, Georgios A. Antonopoulos and Georgios Papanicolaou uncover the reality of organized crime in our world today. 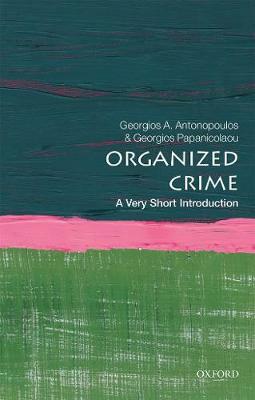 Shining a light on the people involved in organized crime, Antonopoulos and Papanicolaou question whether the term 'organized' is used to evoke the image, the operations, and power of a legitimate organization, such as a corporation. Discussing whether there are particular crimes that the label 'organized crime' applies to, or if any crime can be organized, they also consider what happens when organized crime extends beyond borders. Using examples from across the globe, they analyse the different cultural traditions of organized crime, such as the Mafia, Yakuza, and Triads, and also the nature of organized crime, from arms trafficking and drug dealing to extortion. Finally they explore the methods and agencies in place to control and prevent organized crime. ABOUT THE SERIES: The Very Short Introductions series from Oxford University Press contains hundreds of titles in almost every subject area. These pocket-sized books are the perfect way to get ahead in a new subject quickly. Our expert authors combine facts, analysis, perspective, new ideas, and enthusiasm to make interesting and challenging topics highly readable.